The number of Walkaway Campaign members is now almost 150,000. The new smear is to call them the work of "Russian bots". I don't agree with this assessment, but I will also point out that not all these people just left the Democratic Party. Some left quite some time ago; one woman whose last name is Holder claims that she is Eric Holder's cousin and she left back when Reagan was running. Others are people like me and some of my online friends who were never Democrats. But there are others who are the real deal. Click on the #walkAway tag at the bottom of this page to see some Youtube vids of the main type of member, people who have just been red-pilled like Candace Owens. As soon as Supreme Court Justice Anthony Kennedy announced his retirement, pro-abortion groups began lobbying the U.S. Senate to reject any nominee who does not promise to endorse Roe v. Wade. While the U.S. Conference of Catholic Bishops does not support or oppose the confirmation of any presidential nominee, we can and should raise grave concerns about a confirmation process which is being grossly distorted by efforts to subject judicial nominees to a litmus test of support for Roe v. Wade. And we must pray. May Our Lady of Guadalupe intercede for the healing of our nation and our people from decades of abortion on demand. That clears it up for me, especially the last paragraph. 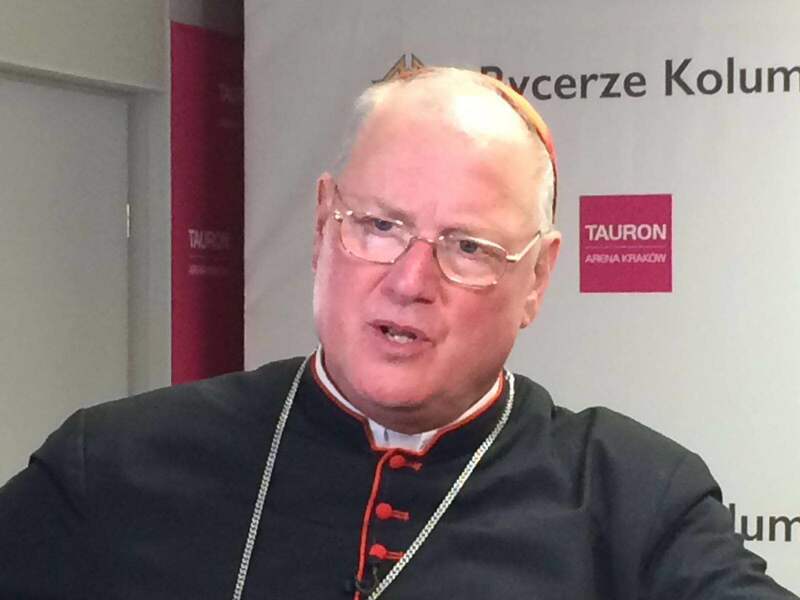 Thanks for your words of teaching, Cardinal Dolan. She is right. Most Trump supporters are really, really nice, and the other side uses name-calling in the place of arguments. "I will never watch the mainstream media again." Beautiful. The "36 comments" link takes anyone who clicks on it to a comment page for another post. This was obviously a mistake, and I can understand how it can be made. He is on the west coast and the article is dated today, so this was done before 6am. He was obviously checking the comments from the other page and accidentally copied that link, or something like that. Then he pasted this in and never read it over. Or maybe he did read it and missed it. This is why, I've been told, editors are needed. You often don't see your own mistakes. I don't have an editor, so I have to make do with my own proofreading. But I also take pride (my "core sin", I am told) in taking my time at my work and self-editing. Is it possible that Mark Shea rushes into his blogging with armfuls of invectives he needs to hurl at these straw men he calls Christianists and does very little in the way of thinking until he has finished spewing everything which comes to mind? Is it possible that people like me might find him compelling if he toned his writing down from a constant screech? Can a person really be this caustic before 6:00 in the morning? three days for being sarcastic. The answer is yes, of course. Not just caustic, but also sarcastic. When he writes things like "the Most Horrible Human Being in America, Hillary Clinton" it turns out that the robots working for Facebook shut that stuff down. 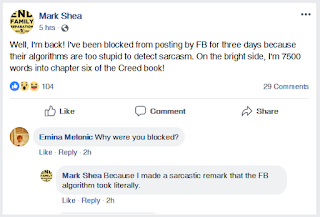 This is why Mark was banned for three days, according to him, during which he made 7,500 words worth of progress on a book he's writing about the Nicene Creed. So that might get chalked up to God using something as imperfect as Facebook algorithms to accomplish His good purpose in the same way he uses something as imperfect as Donald Trump to lower the unemployment rate for working class people. I know several people who have unfollowed Mark Shea on Facebook in recent times due to his constant table pounding about Christianists, which roughly translates to Christians who voted for Trump. His description of people with whom he disagrees vehemently on politics has become such a caricature that many of the traits are not even recognizable to those of us at which the moniker is obviously aimed. For example, no one I know ever became upset over people not wishing them a Merry Christmas. Many of us were concerned that employers were forbidding the saying of Merry Christmas (can't remember if Target was one—people in Ohio, we say what we feel like saying), but no one considered this to be "persecution". We do not bang our chests and chant "We are real heroes! We are real Americans!" We are not people who generally think ourselves as "better than our neighbors" or "better than the Pope", whatever that even might mean. Accusations that we are sadistic baby-jailers who "celebrate murder by thirst" only make us shake our heads and roll our eyes at this point. Yes, "murder by thirst". That's what we "celebrate". Note to people who didn't vote for Trump: when we Trump voters give each other that look and say or think those five words, we do not consider that a celebration. A celebration is when we sit down with family and friends, have food, fun, drinks and laughs and do not even think or talk about politics for the next three hours. We know how to do that. And by the way, we know how to shut up the loud mouth fan-boys on the right in these instances, and we do it instinctively, all. The. Time. I titled this piece Maybe Patheos needs better editors. It is highly likely; they definitely need some better bloggers. This stuff is so tiresome. Oh, yeah. What are "those five words", you were wondering? "This is why Trump won." "In the gun business, we pay attention to people." I was in a gun shop once, talking to a salesman. Suddenly he stopped, stepped back and put his hand on his hip. He shot a glance at me as if to say "one moment". Then I noticed a dude with a long t-shirt had just walked in. He wandered around for a minute, looked at the salesman and then walked out. "That must have been the guy," he said to me shrugging. Then he explained that a co-worker had mentioned someone fitting the description who looked like he'd been casing the joint. His senses were almost instinctive, and everyone in the place was carrying a compact 45 concealed so that's what you need. This happened in February 2017. "I just kept looking at the guy and I was like 'You're Borat' and as soon as I said that... he turned right out the door." It's sort of awesome if the Warrior One guys are really in talks with Showtime for a reality show and the owner says "Showtime is fake!" You know these guys are media savvy. Think about this: I am not claiming this is the case, but what if this whole thing is actually fake? What if they had a guy dress up like Baron Cohen and just claimed to have been pranked by him after seeing the episode making fun of gun ownership? It would still be awesome, and great for publicity if you are launching your own show. Maybe we should all make a video with someone dressed up with a fake beard, skinny jeans and a "dumb-looking hat" and then claim "Hey, man! Borat was trying to prank us!" Genius... sometimes I impress myself. David Griffey, a new friend of this blog, more or less echoes my thoughts on Trump's Helsinki performance by referencing this tweet. Hasson's remark is in response to the comparison of the Helsinki Summit to Kristallnacht and the Pearl Harbor attacks by former Watergate Prosecutor Jill Wine-Banks. The sound of Trump's voice is often to me about as pleasant as the sound of a glass breaking. And often his rhetoric is damaging; I agree with Pikkumatti that Trump could do more to unite the country. But to inflate Trump's unpleasantness or even his damage to Kristallnacht is to violate the rule no one talks about anymore because everyone on the left breaks it everyday. Hitler analogies, Kristallnacht comparisons and labeling everyone a fascist are doled out with absolutely straight faces by people accounted serious. This is just one example of the media overreaction to the Helsinki Summit. Don Lemon gives us the standard brain-dead "not my president" guitar solo after turning the amp up a notch. Beale also takes a shot at Michael Moore's fake righteous anger reminding the left of their conveniently forgetting that Moore accused the entire American intelligence apparatus of deception in order to warmonger in Iraq. By making a documentary! Oh, weren't those the days... But in 2018, even during Trump's most horrible moments, the left and their media is always worse. I'm a Jordan Peterson fan although I don't always agree with him. He has won praise from many people I admire such as Bishop Robert Barron, although with reservations, and the guy makes you think. This video shows the contrast between the short-term rush of scoring rhetorical points and the long-term satisfaction of explaining and understanding of something. 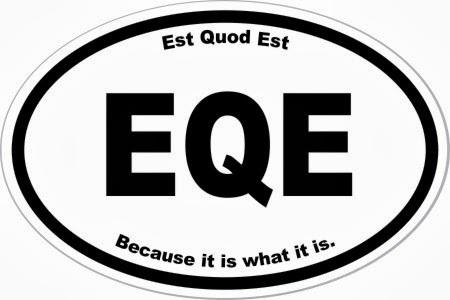 One requires quick-wittedness and rewards in the short-term. The other requires patience and rewards in the long-term. I have never really liked the style of Milo Yiannopoulos and I think this video illustrates why. Arrogance and dismissiveness... check. The full article is available here for context. But if the pull quote is a little too long for you, I shortened it even more in a nice meme/quote image, suitable for sharing. I suggest people posting it in your office, or maybe on the bulletin board at your parish for reasons which should be entirely obvious.